Denver, 미국의 엠버 호스텔 | 호스텔월드에서 예약하세요. 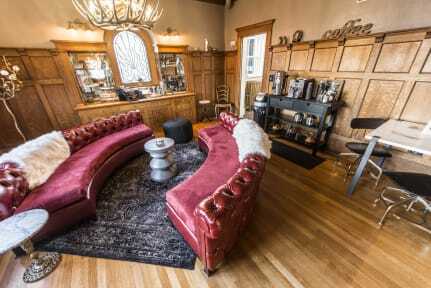 Get ready to kick back and enjoy the swankiest retro hostel experience of a lifetime in our 9,000 sq foot mansion! Whether you're in the mood to party or sit by the fireplace with an espresso and good book, we are the hostel for you! At Ember we believe hosteling is a way of life and that staying in one doesn’t mean you have to sacrifice luxury or style. That's why ours has been carefully designed to bring you all the comforts of a boutique as well as the fun atmosphere of a social hostel. Our five star bunks include pillow-top mattresses, plush king size pillows, and in-bed outlets/lights/storage/privacy curtains. Once you’re ready to meet other travelers, grab a beer and head to our gigantic 12 person jacuzzi and fire pit for a little pre-game action. Our hostel is located in Cap Hill just a short walk from the state capitol, downtown bars and an awesome music scene. Capitol Hill was once the home of Denver’s elite and today consists of historic mansions, such as ours. The neighborhood has urban character, eclectic architecture and is well known as a haven for young artists, musicians, and bohemians (like Jack Kerouac who lived at the Colburn Hotel just one block from Ember Hostel). Near us is Colfax Avenue, which is the concert and live music hub of Denver! The Fillmore Auditorium, The Ogden Theater, as well as numerous late-night bars, coffee shops, thrift stores and restaurants are just blocks away. The Denver Art Museum, Santa Fe Arts District, and South Broadway bar scene are also walking distance from the hostel. Travel allows us to fill our life with adventures and create stories we can tell over and over. Like the saying goes, “So much of who you are is where you have been.” Travel and hosteling provide unique opportunities to meet people from all pockets of the earth. It opens our eyes to the true human experience. We at Ember take pride in cultivating that experience and can’t wait to be a part of your journey! Cancellation policy: 24 hours before arrival. Guests who do not cancel prior to 3 pm local time the day prior to arrival will be charged for the first night stay and the remainder of their reservation will be cancelled. If you chose a "non-refundable" rate, your credit card on file will be charged the full amount at time of reservation. Credit/debit card used must match the government issued ID of guest. One person per twin bed. Must be a traveler with residency outside of Colorado with travel document. Check in begins at 3 pm. If you arrive to Denver earlier, we can happily host your luggage in our secured storage while you set out to explore the town. Check out is at 11 am. All guests and their belongings must vacate their room before 11 am so our staff can adequately prepare rooms for our next set of travelers. If you are departing Denver later in the day, we can happily host your luggage in our secured storage while you make your last rounds on the town. The full cost of the reservation is due at check in, along with a valid form of ID (driver's license, passport, etc). The hostel reserves the right to refuse any patron at any time for any reason. Website prices do not reflect local lodging tax. This property may pre-authorise your card before arrival. Taxes not included - 14.75%local tax will be added. Age restriction: Minimum age for guests is 18 unless accompanied by a parent and pre authorized. Please send us an email to discuss. Guests are responsible for damage or loss they cause to the property. To avoid charges, please return your key card to the front desk and leave your linens and towels on your bed before departure. If your items are not found on your bed, charges to cover the cost of replacing the items (towel: $5, key card: $5) may be incurred. All damaged property will be assessed and charged to parties responsible. Parking in our lot is available for Ember guests on a first-come, first-served basis. Please call prior to approval to confirm availability. We encourage biking, walking and public transit for getting around. Public street parking is also available nearby. Please be mindful of limited hours and metered fees. Sheets, pillow and blanket on a pre-made bed, as well as a towel are provided to each guest. Stays of longer than 4 nights will have their sheets and towels refreshed on the fifth day. Any guest may trade their towel in for fresh ones anytime. Daily housekeeping of rooms, bathrooms and public space is provided. Ember Hostel is a community of like-minded travelers. 14 days is the maximum length of stay. Requests for longer stays will be assessed on a case-by-case basis by management. Guests only. We do not allow non-registered guests to hang out on our property. We aim to create a safe and secure space for our guests and will ask any non-registered guests to leave.